Nin-gish-zida, the Sumerian Serpent-Dragon of Heaven, who offered man (Adapa, priest of Enki [the God of Wisdom and Knowledge]) the food and drink that would have bestowed immortality on him and consequently mankind. Langdon alternately calls Ningishzida a "Mushussu" dragon (p. 284). Line drawing from a stone libation vase of King Gudaea of Lagash, Sumer, ca. 2100 BCE. 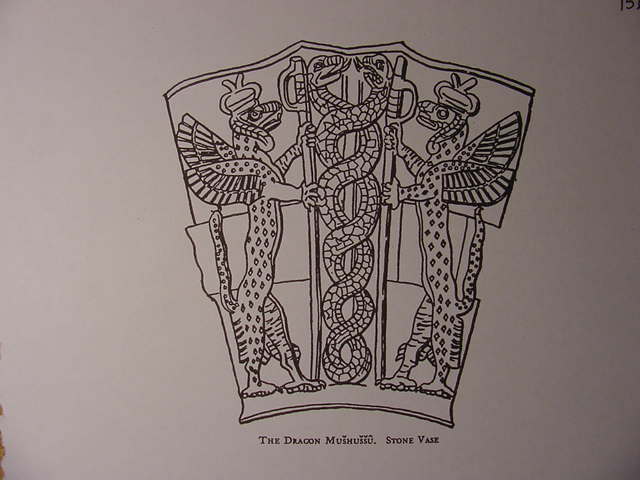 I understand Nin-gish-zida to be one of several Mesopotamian deities behind the Serpent in the Garden of Eden (cf. p. 285, figure 88. Stephen H. Langdon. The Mythology of All Races, Semitic. Vol.5. Boston. Marshall Jones & Co., 1931). Note this drawing also appears again titled "The Serpent Lord," in Joseph Campbell's Masks of God: Occidental Mythology (cf. figure 1, page 10. "The Serpent's Bride." New York. Viking-Penguin. 1964. Reprint 1991 by Arkana). Campbell, like Langdon, identified this deity as _one of several prototypes_ which had been recast by the Hebrews into the Garden of Eden's Serpent. Please click here for my article identifying the various deities fused together and recast as Eden's Serpent from Mesopotamian myths. Ningishzida besides being a prototype behind Eden's Serpent is also a prototype behind Eden's Cherubim.